In the Schoenstatt shrine Ana Mon asked God to help her discover her personal task, her special commission. Soon afterwards she saw street children searching rubbish bins for something to eat. “Those could be my children”, she suddenly realised. 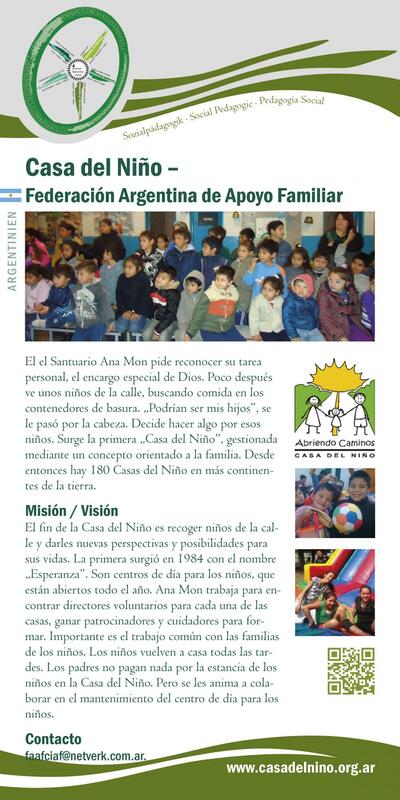 In the meantime there are 180 Casa del Niño on a number of continents. The goal of the Casa del Niño is to take children from the streets and to give them new perspectives and possibilities for their lives. The first started in 1984 and was called “Esperanza” – Hope. The children go home every evening. The parents pay nothing for the care the children receive. However, they are encouraged to help maintain the day care centre for the children.